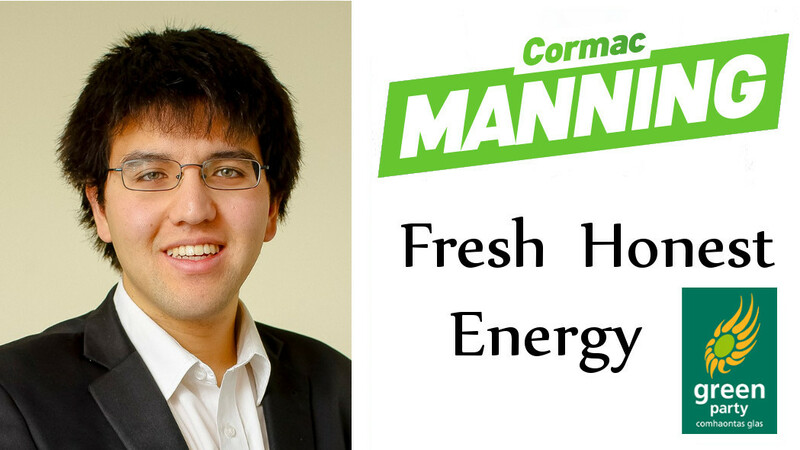 Hi, my name’s Cormac Manning and I’m standing in Cork North West in the upcoming general election for the Green Party / Comhaontas Glas. I grew up and still live in Ballincollig. Cork is a great place, but there’s so much we can do to make it better. I will work for the common good, to deliver practical improvements to our lives. We need a more balanced economic recovery for all, not just for the well-off or for Dublin. We need more effective public transport and to support community co-operatives to develop renewable energy. We need something more fair than the current Government but more honest and more practical than the current Opposition. I believe it is time to return a Green voice to the Dáil and so I am asking that you consider me for your no. 1 vote. Cork North West is a large and diverse constituency, ranging from Ballincollig to the Kerry and Limerick borders, including Macroom, Charleville, Millstreet, Kanturk, Newmarket, Dromahane, Enniskeane, Gaeltacht Mhuscraí and many, many rural communities in between. Over the coming weeks I look forward to canvassing across the constituency and hearing from as many people as possible. If there’s anything I can help with, or if you’re interested in my position on any public issue, feel free to get in touch. I gcór Corcaigh cothrom agus Éire ghlas.